This St. Patrick’s Day scavenger hunt for kids printable is so much fun. Most of the items on the list that I feature can truly be found around the house which makes this a home run for parents. I tried to make this list turnkey which just a sprinkle of holiday fun extras thrown in for good measure. I know how it is during the year. Always something to do or buy, right? Well, this St. Patrick’s Day activity for kids is FREE. All you have to do is download is below and enjoy it with your family. Here is a little secret for some of the checkboxes like “Find a green animal”…. I print up a green animal picture and hide it! There’s really no reason to BUY anything for this St. Patrick’s Day game. You could, of course, head to the Dollar Store and find a green teddy bear – something like that. But if you are in a bind, a printed photo will do just fine. 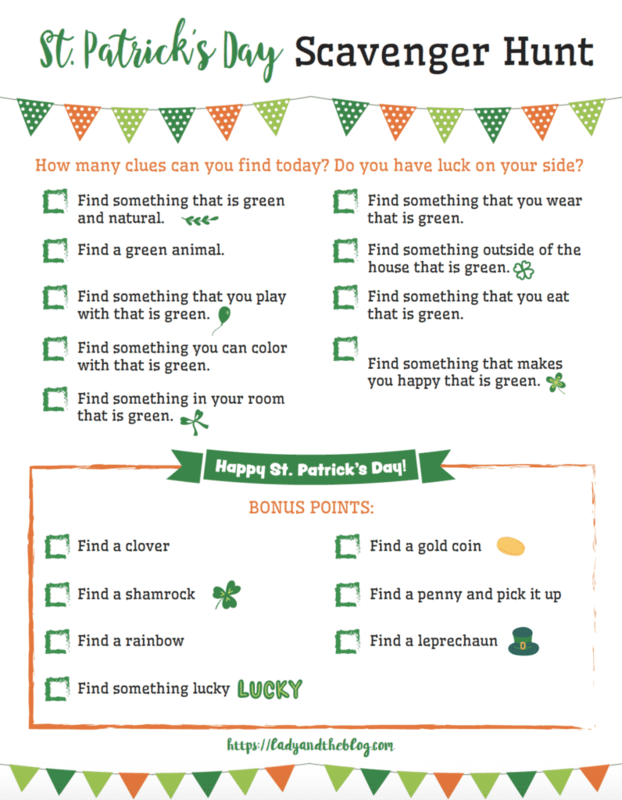 You need a little luck to find everything on this St. Patty’s Day game. But I bet you will get them all! Here’s the secret! The items found on the bottom of the sheet are the HARD TO FIND ITEMS. The ones that are special. So, you can tell your children that the REAL scavenger hunt is the TOP LIST and the BONUS is the bottom. That way, if you can’t find a rainbow or a penny… then no hard feelings. 🙂 But truth be told, a quick run to Target and I am sure that you will be able to get everything on this list. If you want to make sure that you have everything you need, check out these online finds that will complete the hunt. St. Patrick’s Day celebrates the Roman Catholic feast day of the patron saint of Ireland. St. Patrick died on March 17, 461. So, the holiday is marked on or around the day of his death. 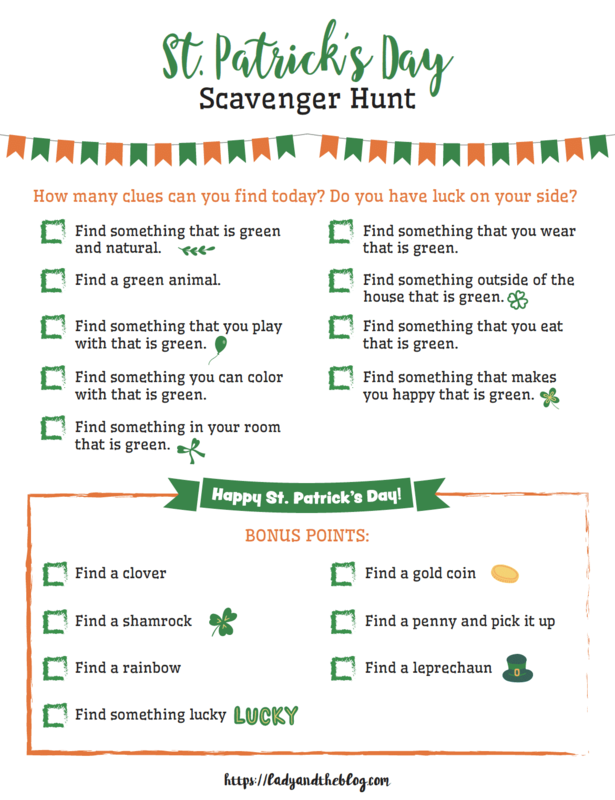 Ready To Download Your Copy Of The Kids Scavenger Hunt? To download your copy, click here. I hope your children enjoy this St. Patrick’s Day activity as much as mine do. You can time them as they race around the house looking for all of these items on the list. Or you can allow them to explore at their leisure. It’s really up to you and how you want to play it. I think the younger they are, the less of a timed event it should be. What do you think of this list? Did I leave anything out? Would love to hear your thoughts!